I try to eat as much of the food I buy as possible. I plan out meals before I shop, save leftovers and compost whatever’s left. But until recently, I hadn’t made stock from leftover veggies or bones. To put my money where my mouth is, I set out to make chicken stock. In my mind, making stock seemed like the final frontier in food efficiency. Kind of like Native Americans using all of the buffalo, only a lot smaller. The basics are easy enough–toss everything in a pot and let it simmer. Then I turned to this helpful page to answer the questions that remained. One such question was whether to call it stock or broth. Using the above site as a guide, I boiled it down to this difference: stock takes three hours longer. Whatever we’re calling it, I threw in some carro t peels, past-its-prime cabbage and the celery parts that I normally compost. About three hours later, the house smelled like chicken soup and I had about 6 cups of broth. Now, the next time I say I’ve made a homemade soup, I’ll mean all of it. This entry was posted in Household, Personal, The Weekly Waste Word. Bookmark the permalink. Both comments and trackbacks are currently closed. Doesn’t it taste WAY better than using pre-made stocks or bouillon cubes? You can use stock in a million ways… cooking rice, stir fries, etc… and you can’t go wrong making soup if it has a good stock. Well, I may be able to find a way to go wrong making soups…but it does seem like homemade stock provides a good start. I haven’t made anything with the stock yet, but I’m confident it will taste much better. Thanks for cheering me on! I’ve been making stock recentyl as well, and it’s great for when you have those little bits of leftovers that need to go somewhere. I’ve used veggie trimmings, aging veggies, even added apple parings to one (you oculdn’t taste it in the stock, but it added just a tiny hint of sweet that was a very nice change). We BBQd chickens over the summer, and turned the carcasses into chicken stock. It’s all good, and helpful for those of us trying to live reduced sodium lifestyles that have ruled out store bought boullion and soups, as well as saving money and food. I keep a one-gallon tub in the freezer and toss in there every scrap that can be used for stock. It’s also a place for tail ends of things that will go off in a few days (tomato juice, half an onion, etc.). Apple cores too — they’re great in stock. Then, when the tub’s full, it’s time to make stock. The only food that goes in my compost pile is stuff that has gotten the best of me in its need to decay, and I always feel guilty. Some of blame lies with our CSA, though, which sent us ELEVEN bunches of greens last week. Gah. I do the same thing — I always have a zipper bag in the freezer waiting for my trimmings. Sometimes I just make vegetable stock and use that instead of water next time I make chicken soup. And yes, I always add my apple cores too! If you make vegetarian stock, then you still compost the vegetables after straining out the stock. Cook up your bones separately. Back when I ate meat, I’d pressure cook the chicken or turkey carcass until the bones were mush so that I could mix a little in with my dogs’ food with no risk of sharp points puncturing their insides. Yeah, I do compost the stock-strainings; I totally forgot about that. I’m just taking notes from you guys…thanks for the tips. I especially like the freezer idea, which should cut back on the rotting produce smell. I love the idea of keeping scraps in the freezer for stock! I usually just end up scavenging the bottom of the crisper for stock parts. Sometimes I end up having to buy the boxed stock at the grocery store, and I always feel so ashamed when I do. Actually, the difference between broth and stock is that stock is made using only bones. 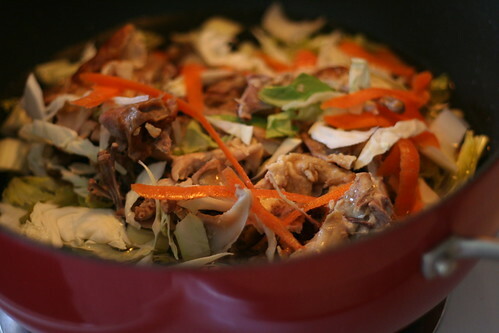 Broth can be made using both meat and bones. A tip I’ve recently started using is to fill a few ice cube trays with stock and freeze it. Some recipes only require a little bit of stock and it comes in really handy to break off a few cubes at a time. I also heard the veggie broths (once cooled down) are great for houseplants — if you think you’ve made more than you can handle. My husband often makes his own chicken stock with carcases however his attempt to make vegetable stock was disappointing. It was not even close to as potent as the store bought and seemed to be a big waste of the vegetables. At the time we were not composting. I think I might try again… any advice about ingredients not listed above or ingredients/proportions that give it more kick? Are oranges or orange peels reasonable to add? I work in a restaurant and there is so much food wasted I just can’t believe it. It makes me sick. Thank you I just needed to get that off my chest. I just dicovered your blog, so I’m sorry for commenting in old posts. Saying that, my mom makes chickes stock often (she loves it!). But the thing is that to make this stock she takes 3 whole chickens and a lot of vegetables (good ones!) and in the end the only thing that she accually uses from all this is the stock. I feel horrible because we lose 3 chickens and all the vegetables for a pound of stock. How can she waste less food on that? Hmm…this sounds like putting the stock before the chicken. Could she use the chicken meat in the soup or separately after it’s been boiled? If not, I’d suggest going for a slightly much less chickeny stock. 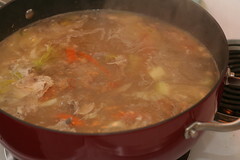 In my experience one of the easiest ways to make stock is to slow cook it overnight. I roast a chicken in the slow cooker and eat for dinner. Then I leave the juices in the cooker on warm and once I have a carcass put it back in with all the other ingredients and top up to 2/3rds with water. Leave on low overnight. Slow cookers are energy efficient and also some energy providers have reduced rates during the early hours making it more efficient for some (I believe)? Next morning leave to cool and refrigerate. Later that day remove fat from top and freeze or use as required. I love making stock as it not only reduces waste but also means you can reduce salt intake should you need/wish too, so excellent for using in children’s meals – in particular when weaning babies.